Mumbai: The Securities and Exchange Board of India (Sebi) on Thursday issued a warning letter to Punjab National Bank (PNB) for delaying disclosures with respect to the Nirav Modi scam, the company said in an exchange notification. The regulator said that there was a delay of one-to-six days in making disclosures to the exchanges that they have filed a complaint with the Reserve Bank of India (RBI) and Central Bureau of Investigation (CBI) with respect to a scam involving the Nirav Modi group and the Gitanjali group. PNB’s total exposure to the fraud entities stands at Rs14,356 crore. According to the regulator, this delay in informing the stock exchanges is a violation of the Listing Obligation and Disclosure Requirements (LODR), according to which companies need to inform stock exchanges about any price sensitive information in a timely manner. The regulator asked the bank to be careful in the future. “Non-compliances are viewed seriously and PNB is hereby warned and advised to be cautious in future to ensure compliance with all applicable provisions of the SEBI LODR Regulations," said the regulator in the letter. PNB’s loss in the fourth quarter of 2017-18 was Rs13,416.9 crore, compared with a net profit of Rs261.9 crore in the year-ago period. 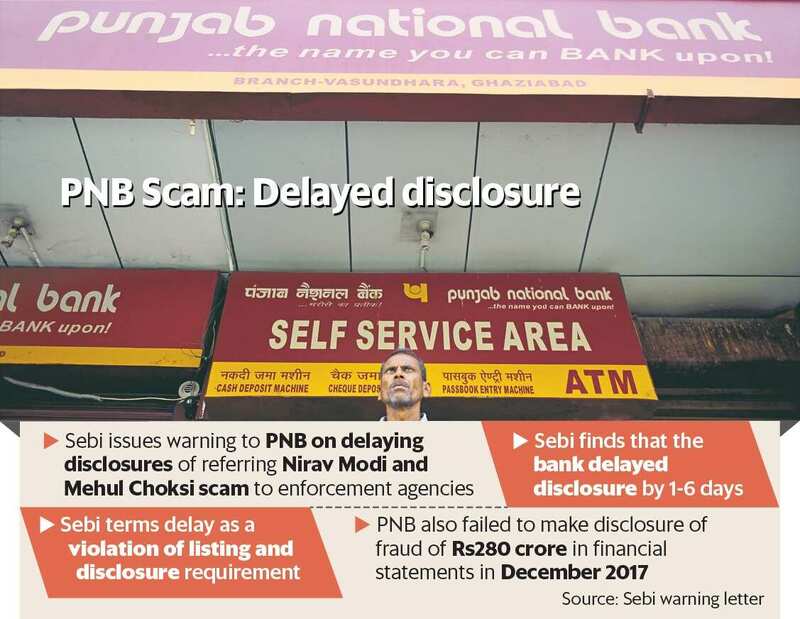 PNB in a disclosure to bourses in February and March said that it had come across fraudulent transactions worth Rs11,400 crore (it now stands at Rs14,356 crore). “The administrative warning cautions the public sector bank not to delay material disclosures. It (Sebi) also seems to be pushing its wish to make banks more honest with their disclosure and recognition of bad or doubtful assets in line with its 4 August circular," said Sandeep Parekh, managing partner, Finsec Law Advisors. Parekh is referring to a the Securities and Exchange Board of India circular which mandated listed entities to disclose defaults within a day. However, it was withdrawn on 30 September after representations from banks. Currently the circular has been referred back to the Sebi board for consideration. It is not uncommon to come across such delays by banks in informing stock exchanges of fraud cases being referred to enforcement agencies. Typically, when banks refer a case to enforcement agencies, if it is a case of fraud, the account is classified as a non-performing asset. However, these are seldom disclosed to exchanges. For instance, Bank of Baroda, which referred a case of fraud against the promoters of Rotomac Pens in February, did not initially disclose this to stock exchanges. Similarly, even when a State Bank of India-led consortium filed a case against now defunct Kingfisher Airlines in August 2016, it was not disclosed to exchanges. Sebi is also considering asking banks to disclose to stock exchanges complaints of fraud made to probe agencies.